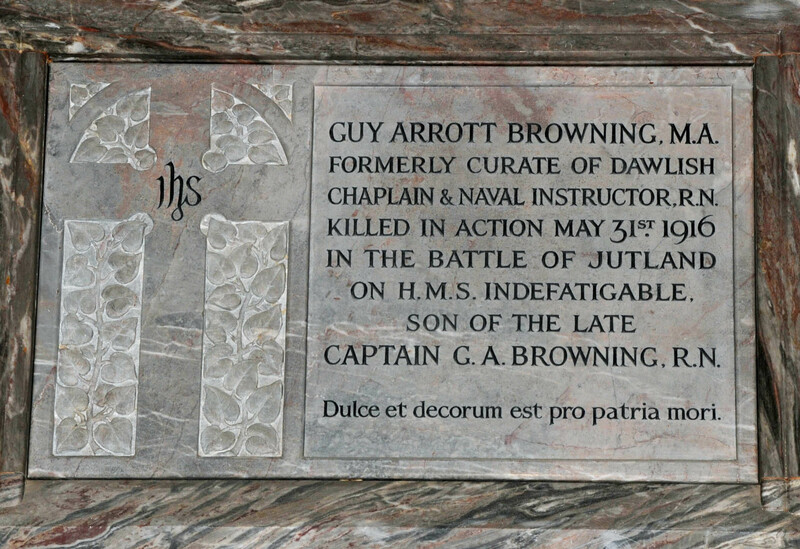 Guy Browning joined the Royal Navy in 1903 and was a Naval Instructor and Chaplain. He joined H.M.S.Indefatigable at the outbreak of war. The Battle of Jutland was the largest naval battle of World War I, fought between 31st May and 1st June 1916, in the North Sea near Jutland, Denmark. The Germans' plan was to use five modern battlecruisers to lure the British through a submarine picket line and into the path of the main German fleet. The plan didn't succeed, and the Royal Navy suffered the greater losses, but after the end of 1916 the German High Seas Fleet did not re-emerge into the North Sea. 70 ships of the High Seas Fleet surrendered to the Grand Fleet on 21 November 1918. 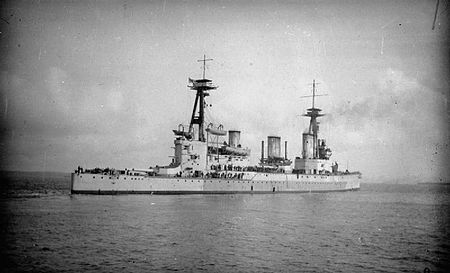 The battlecruiser HMS INDEFATIGABLE (Captain Charles Sowerby) was locked in a gunnery duel with the German battlecruiser VON DER TANN when a German salvo was observed to strike HMS INDEFATIGABLE midships. HMS INDEFATIGABLE lurched out of line to starboard only to be stuck squarely by a second salvo. It appears that HMS INDEFATIGABLE received a shell in her X turret which ignited cordite charges, the resultant flash shooting down to the aft magazines. It is equally plausible that a shell may have penetrated the magazine directly. The ship was wreathed in smoke but when it cleared, HMS INDEFATIGABLE was sinking by the stern and listing over to port. She sank in seconds taking 1,017 of her crew with her. Guy Arrott Browning was the second son of George Alexander (1840- ) and Mary Elizabeth Browning (1849- ). His father was a retired Captain, R.N. In 1881 they lived in Wimbledon with four sons, Kendall Colin (1875-1936), Guy Arrott (1876-1916), Hamilton Arthur (1879-1891), and Herbert Acland (1880-1955). In 1891 they had moved to 20 Macaulay Road, Clapham and in 1901, they were living at 2 Longlands, Dawlish where the household consisted of George A Browning, 61 (retired Captain, R.N. ), Mary E – his wife 52, Kendall C, 25 (M.A. Cambridge Univ), Guy A, 24 (Clergyman, Church of England), Herbert A, 21, (Univ graduate, Medical student), Helen M Browning, 42, sister-in-law. The parents had moved to 11 Barton Terrace by 1911 with Helen M Kendall, the wife's sister. A memorial plaque to this former curate of Dawlish is placed in St Gregory's Church. He was a Curate from 1900-1903.